Hardly three years have passed since it was founded in 2012, but the Awtar Quartet has established itself as one of the most dynamic music ensembles in Cairo. The quartet’s members – violinists Yasser Ghoneim and Khaled Saleh, violist Essam Abdel-Hamid and cellist Mohamed Abdel-Fattah – seem to have found the perfect formula for reaching out to new communities and locations, as they continue to lure a variety of musical tastes into their events. From the Cairo Opera House to the Russian Cultural Centre, the Bibliotheca Alexandrina and Alrabaa Cultural Centre, their concerts attract the listeners regardless of age and background. We all agree that art – and music for that matter – should be an inclusive cultural phenomenon. However, such noble intentions might not be enough to put this claim into practice, and this is where well planned outreach strategies come in handy. In this context, the Awtar Quartet’s dynamism and ability to reinvent itself helps musicians to foresee and overcome any potential barriers that might keep audiences out before they even appear. For instance, in addition to their principal vocation, classical music, the quartet also weaves in other genres such as jazz, tango, Latin works, Russian folk and Arabic music. To highlight the variety of their repertoire, they often also invite other musicians to join them for select performances. Over the last three years, the Awtar Quartet’s blueprint has been working very well. One would have been satisfied had the musicians been content with those tested – and obviously successful – strategies. But as if this was not enough, they have decided to take on their shoulders yet another creative challenge – reaching out with western classical music to children from the Cairo’s economically underprivileged areas. On Friday 28 August, the Awtar Quartet’s new creative formula, coined “Music and Animal Stories for Kids”, premiered at Artellewa, a cultural centre operating in the heart of Ard El-Lewa, an underprivileged neighbourhood where it is the only provider of arts in the area. 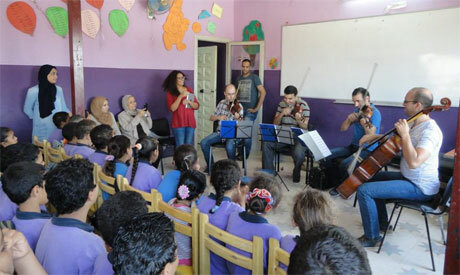 Funded by a Fulbright Alumni Community Action Grant, which was awarded to the quartet’s violinist Khaled Saleh, the concert was their first interactive event, part of an educational series. The second event, which took place on 31 August, targeted children from the Tawasol School in Stabl Antar, a Cairo slum. The short-term plan however will expand towards October, when the quartet is to give two monthly concerts in several similarly deprived areas. According to Saleh, the long-term plans are to reach out to an even larger segment of children through schools, NGO’s and cultural centres. In Artellewa, a group of children gathered in a small room and for almost one hour remained fully focused on the musicians and the storyteller Anne Alfred. The event began with a small introduction to the music, during which the narrator, Alfred questioned the children about the music they like. “Mahraganat,” was the reply given more than once. The musicians went on to introduce some animals to the children, imitating the sounds of a cat, mouse, dog, hen and swan on the strings. Another exercise introduced the children to musical dynamics and ranges, showing them how animals portrayed by the instruments produce high and low notes or how their sounds can be louder and softer. As the young audience heated up, Albert began telling well-known stories – “The Tortoise and The Rabbit”, “The Lion and the Mouse”, etc. – to the extracts from Sergei Prokofiev’s Peter and the Wolf and Camille Saint-Saëns’ Carnival of the Animals. The arrangement aimed at creating the background to the stories rather than walking the listener through segments of the compositions. The formula worked out very well, raising interest, even excitement, and keeping the children engaged. At a certain stage, some boys were giving the musicians the thumbs-up whenever they enjoyed a passage played or recognised the sound of an animal. After the concert, I asked one of the young girls what in particular she liked about the event. “Music and stories,” was the answer which in two words wrapped up the whole evening. After a moment of thought, the girl began retelling one of the stories and imitating the animals’ sounds that were played by the musicians. Her friends wanted to join in the conversation, adding their two cents’ worth as they talked about a lion, a mouse or described the values of friendship. Obviously, it took the Awtar Quartet less than one hour to make such an impact and provide material about which the children will keep talking for long time. Saleh reveals that the ensemble was not sure how the children would receive the event, and they therefore structured it based on observations of other concerts held for a young audience. “We have been thinking about children for a long time. 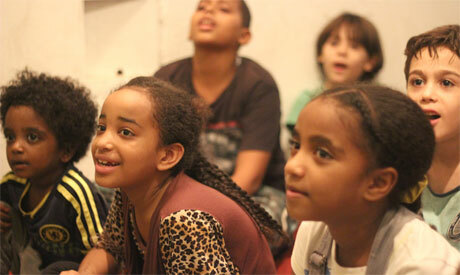 I have been watching children attending some concerts tailored for them by the Cairo Opera House. I think that many such concerts are probably too long and too heavy in the way they are executed,” he explained. Saleh is also aware that the young audience of the Cairo Opera is very different to the millions of children living in impoverished communities, who would not even consider visiting the big white building in Zamalek – or any other major cultural location. The intelligent musical arrangement generated a lot of enthusiasm and interaction on the children’s part and the whole project soon drifted towards the creative spheres where one no longer looks at art from any specific cultural or social standpoint, but absorbs it in its entirety. Western classical music might have seemed like a total cultural stranger at this location turned into a joyful endeavour where music blended with stories, supporting, following or leading them at the same time. Though the event proved very successful, Saleh explains that he musicians are still testing the waters. “We will observe the children’s reactions during the concerts. Further, continuous evaluation will allow us to perfect and develop the project. It will take us some time to reach the final framework that would work best with children from different districts and backgrounds,” he clarifies, adding that the musicians have already thought about incorporating some visual elements – such as a simple puppet theatre – into the performances. Having attended the event, however, one feels it is not necessarily about the musical genre used but about how it is used to generate interest. Undeniably, classical music is one of the great artistic tools whose richness will infuse the children’s lives with many cultural values. But the gains of such an event are many, with the core beneficial factors touching on the development and upbringing of young minds. In the long run, if the children are exposed to the arts and culture more frequently, the practice will affect their sensitivity in looking at and absorbing life, whether actively or passively. Thousands of research papers testify to the benefits of exposure to music and arts in general, many mentioned in previous articles on those pages. Now that the Awtar Quartet has stepped in the game, it will no doubt be an important player in shaping the cultural and aesthetic development of children.